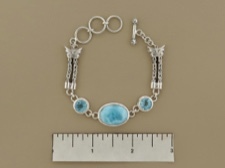 Handpicked larimar stone sits between two beautiful blue topaz, set in sterling silver and connected by two strands of sterling byzantine chain. Handcrafted with classic Bali design and workmanship. 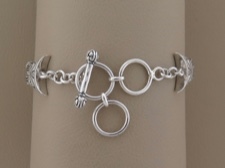 Closes with a sterling toggle that adjusts to 6.25, 6.75, or 7.25 inches. This piece of larimar is of exceptional quality. 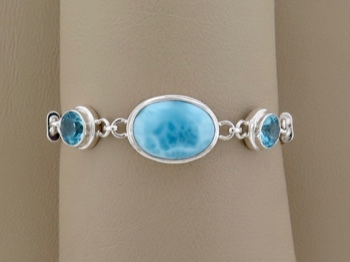 Larimar is a rare gemstone found only in a mountainous, hard to access province of Barahona in the Dominican Republic and must be excavated from an extinct volcano. A very special treasure!